I know that I’m about to sound old, but what’s the deal with selfies? I was just laughing over a post by one of my son’s friends about the correct way to take and post a selfie. We live in a digital, social media crazed, generation. In today’s world if you have a phone you can post your thoughts and views for the world to see, hear and read in an instant which can be very good or very bad. With so much digital clutter out there it’s tough to stand out in the crowd unless you are willing to do something extreme. I know that I’ve heard lots of teenage boys talk about becoming famous and supporting themselves someday by having a YouTube channel because if you get enough views YouTube will pay you for your goofiness. I like Facebook because it’s fun to see what is going on in people’s lives but if you want to stay in touch with your kids you really need to add Snapchat and Instagram to your phone apps. It seems to me that this selfie generation is more interested in images and self-made videos than in reading unless you can express yourself in 140 characters or less in a text or Twitter post. If you want to keep organized in this social media age you need to figure out how to use hashtags (#) because that’s how this generation organizes all of their social media clutter. Social media can be powerful and fun and I participate in it too, but I still don’t get the selfie. I did a little wiki research on the origin of the selfie. According to wiki, taking a pictures of yourself and calling it a “selfie” was started in 2005 by photographer Jim Krause. Selfies are taken at angles to try to accentuate one’s appearance and people can go to great lengths to get the perfect selfie shot that is as flattering as possible. Both sexes take selfies but men who post lots of selfies are more likely to have narcissistic tendicies than women. A Samsung study found that 30% of the photos taken by people aged 18–24 are selfies. A 2013 Facebook study found that, ” posting photos of oneself correlates with lower levels of social support from and intimacy with Facebook friends (except for those marked as Close Friends) and that, “those who frequently post photographs on Facebook risk damaging real-life relationships.” I guess the phone companies are trying to help us get over ourselves and move from the “selfie “to “groufies” and “wefies” with new wide-angle phone lenses. I don’t mean to pick on this generation. I’m sure if you could bring an iPhone back to the 1920’s the selfie, tweets, snapchats, and hastags would be alive and well (#ragtime, #flapper, #ModelA, #prohibition). The truth is that as long as there has been two people there has been self-esteem issues and a need to be heard. Adam blamed Eve to try to justify himself to God, Cain killed Able because he thought that God loved his little brother more than him, King Saul was murderously jealous of a shepherd boy named David, and the Jewish religious leaders killed Jesus to save face and to try to maintain their position as spiritual leaders to the people. Think about how much time we waste worrying about what others think about us and trying to make ourselves look good to others. The next time that you or I post something shouldn’t we be asking ourselves why we are posting it? I know that I’m the pot calling the kettle black because I LOVE to brag about my kids on social media and have people read my blogs and see what they think of my ideas and viewpoints. Sometimes I wonder though if anyone is really listening to all this social media “talking.” I mean do we always read what we are “liking?” My kids told me that there is social media etiquette. Apparently you should only post a maximum of one post a day or people will start ignoring your posts. They call my manna blogs “spiritual spam” and they probably have stopped following me or ignore my posts on Facebook. Well, I hope that I have not come off as a killjoy this morning but I guess I’m just trying to advocate that we move beyond the “selfie” once in a while to the “otherie” (I know groan…). The Bible has a lot to say about looking beyond oneself. I think that I’ll just leave you with Philippians 2:1-11 this morning because it says what I’ve been trying to say so much better. 1Therefore if you have any encouragement from being united with Christ, if any comfort from his love, if any common sharing in the Spirit, if any tenderness and compassion, 2then make my joy complete by being like-minded, having the same love, being one in spirit and of one mind. 3Do nothing out of selfish ambition or vain conceit. Rather, in humility value others above yourselves, 4not looking to your own interests but each of you to the interests of the others. 5In your relationships with one another, have the same mindset as Christ Jesus: 6Who, being in very nature God, did not consider equality with God something to be used to his own advantage; 7rather, he made himself nothing by taking the very nature of a servant, being made in human likeness. 8And being found in appearance as a man, he humbled himself by becoming obedient to death—even death on a cross! 9Therefore God exalted him to the highest place and gave him the name that is above every name, 10that at the name of Jesus every knee should bow, in heaven and on earth and under the earth, 11and every tongue acknowledge that Jesus Christ is Lord, to the glory of God the Father. Thanks for sharing, Len. Well said. 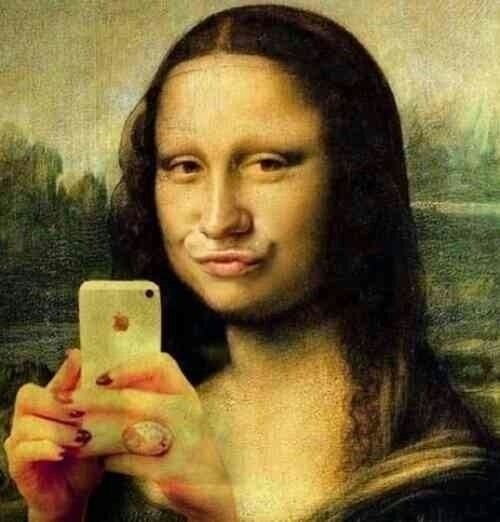 And I REALLY don’t get the duck lips thing!